After finishing the Broad Street Run on May 3rd I was on top of the world. I had survived the crowds, I accomplished my time goals, and I felt like I gave the race my very best effort. What I was NOT feeling was the urge to race again anytime soon. I’m sure that this is a fairly normal reaction after the exertion of a 10 mile race, but it was an unusual feeling for me. Leading up to Broad Street I had been a total racing junkie, eagerly participating in ten 5Ks, and two 10Ks since the first of the year. For me not to feel excited for my next race was very strange. I felt tired, sluggish, slow, and achy in the days following Broad Street and did not feel any more excited about racing as the next week passed me by. Now, normally when you don’t want to race the solution is simple – just don’t sign up for a race!! – but unfortunately for me, I had already signed up for two races in the same weekend two weeks after Broad Street. I wasn’t feeling very confident about these races, but I was determined to show up and try my best! 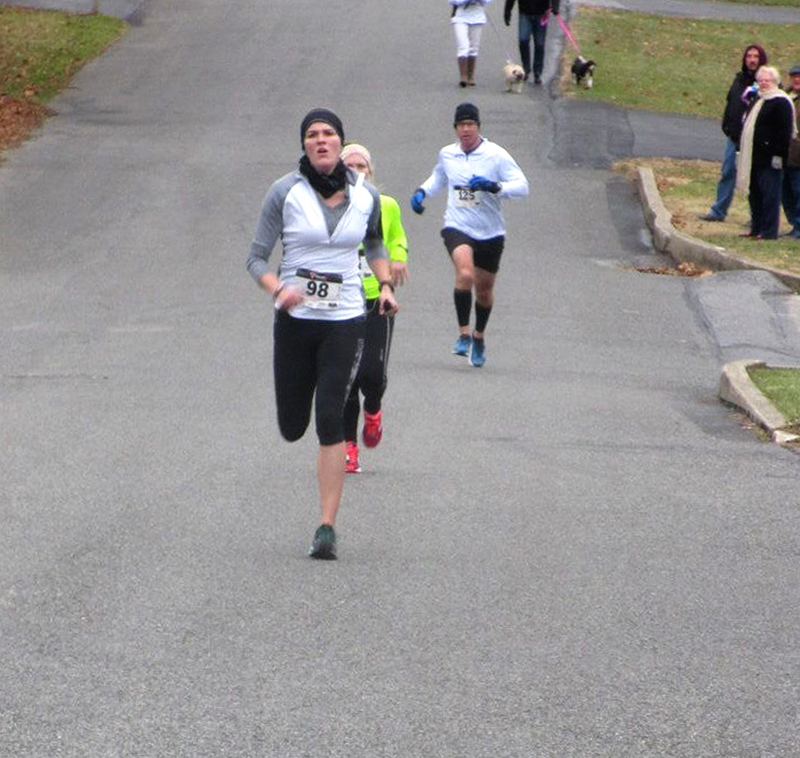 My first race post-Broad Street was the Rocky Run YMCA’s 5K trail race in Media, PA. This was my second year running this race. Fatigue and soreness aside, I was MUCH more prepared for a trail race this year than I had been at this time last year. I’ve been doing lots of trail running (including running on the very trails where the race was taking place) and I’ve already run 3 trail races this year. With this in mind I went into the race feeling calm (but not exactly pumped) and interested to see what I would do compared to last year’s time. The race began promptly at 6:30PM and I set off with 90 other 5K-ers, being careful not to go out too quickly. Matt and Piper cheered me on from the parking lot just before the course turned down into the woods behind the Y. The course was modified slightly from last year, with a new surprise uphill in the first mile and then a super-steep, eroded, single-track downhill almost immediately afterwards. This is my least favorite type of downhill because I work so hard to stay upright that I feel like I don’t get any time for recovery. Oh well! The course continued downhill to the turnaround point where I realized with great surprise that I was currently the first place woman! I knew that I had a mile and a half of uphill ahead of me so was a little concerned about holding onto my spot, but tried to stay strong and mentally positive as I ran back towards the Y. With a half mile to go I climbed a steep hill and emerged out of the woods at the bottom of yet another hill in the Y’s sprawling parking lot. Before the race I had imagined myself feeling renewed strength at this spot, a combination of being back on paved ground and knowing that the finish was close, but in reality by the time I hit this point I was totally drained. I shuffled up the hill as Matt cheered and encouraged me to finish strong. I had just turned into the final loop leading to the finish line when a woman zipped by me looking strong, happy, and downright perky. I huffed out “Good job.” as she streaked by and she kindly told me I was doing a good job too. By the time I panted across the finish line in second place I was completely and utterly spent. The photo below says it all… this is EXACTLY how I was feeling at the finish!! Although I wasn’t impressed with how I ended the race, overall I was very happy with my time and second place finish. I completed the race in 26:50 which was 50 seconds faster than last year!! The course was also a little harder this year with that extra up-down in the first mile so this improvement was definitely encouraging. Less than 48 hours after the trail race, I pinned on my bib for the Victory 5K in Downingtown, PA. Last year’s Victory 5K was a total breakout race for me. After a spring of 5Ks this is the race where I finally went sub-25, blowing away my old PR by almost a minute with a 24:17 finish. I knew that I didn’t have another PR performance in me this year, but I was hoping to at least match last year’s time on the fast, flat course. First and foremost, I was tired. I had just raced on Friday and was still feeling sluggish from Broad Street 2 weeks before. It was HOT!!! May 17th seemed to be the first really humid day of the year. Victory’s 1PM start time put us squarely in the direct sun and heat of the day. Blech. I was burned out. Although I hate to admit it, after 14 races in 2015 I was completely burned out on May 17th. That’s the super-long beer line behind us. So… not racing is exactly what I’ve been doing for the past month! 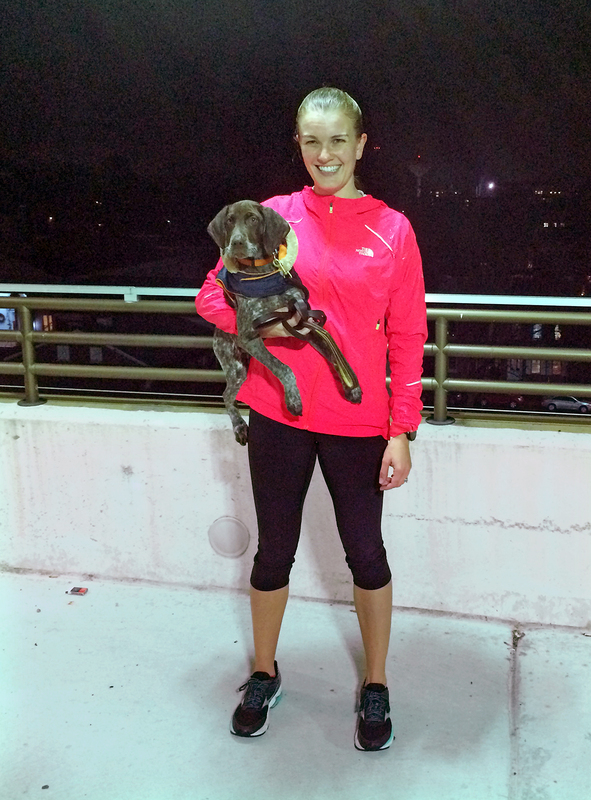 I have continued to go to my Tuesday night track workouts, but beyond that have mostly been satisfied with slow runs (sometimes with Piper in tow towing me), hikes, and miles on the elliptical. I’ve gradually seen my times pick up on Tuesdays but the heat and humidity has been awful this spring and I’ve mostly continued to feel hot and slow. Hopefully the last month will pay off and give me the mental and physical strength to break out of my burned-out funk tonight. Oh yeah… did I mention that in 2 hours I’ll be lining up for my first race post-Victory? It’s still really hot and humid out (even hotter than Victory, actually) and I’m still not sure that tonight’s the night for a PR, but I’m excited to give the Media 5 Mile Race my best shot! Wish me luck!!! 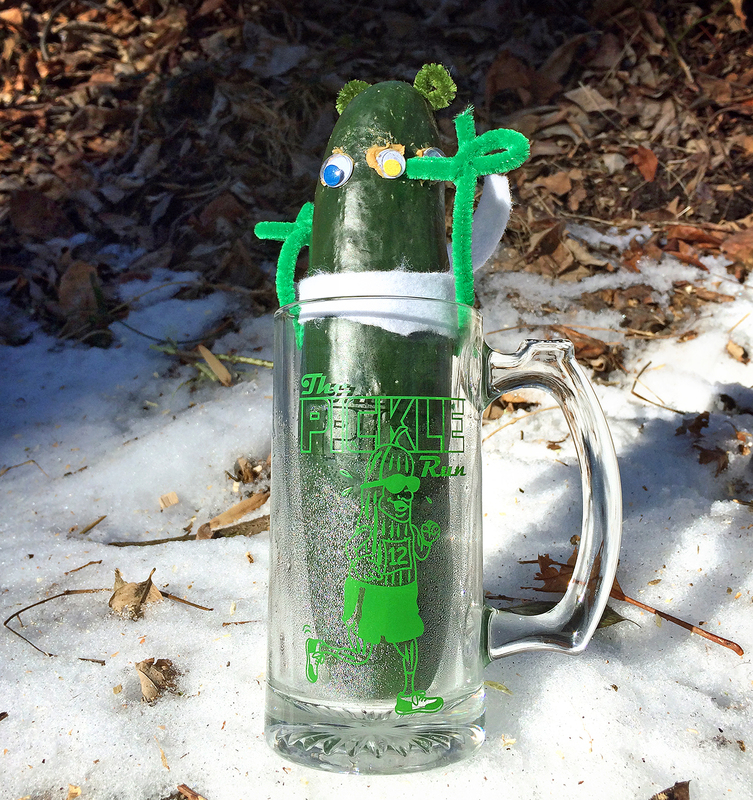 Last Saturday I ran the first of three Winter Pickle Runs in Ridley Creek State Park. “Pickle Runs” are fun, prediction-style races organized by the local race-timing organization, Run the Day. The “winners” of the Pickle Run are the participants that most accurately predict their finish time in advance. This makes for a relaxed, jovial atmosphere and gives everyone a chance to take home one of the big prizes: a googly-eyed pickle in a beer stein! Note to Self: Do not leave your pickle on the counter for a week while out of town in Las Vegas. It will be gross and deflated upon your return!! Saturday’s Pickle Runners chose to run either a 3.1 mile road course or a 3.8-ish mile trail course. I opted for the road option which ended up being identical to the 5K route that Martin’s Run followed back in October. The trail course, which split off from the road after the first half mile, would definitely have been more exciting than my out-and-back road route, but apparently it was also very icy in the woods which made the trails a little treacherous for my non-yaktrax-clad Mizunos. As long as ice isn’t an issue next month I will probably run the trail course in the February pickle. Although I always knew exactly where I was on the road course in terms of mileage, I really missed my Garmin’s pace updates and splits. I usually go out way too fast so it was tough not having any guidance during the first mile. By the second mile I was feeling pretty slow but then had my spirits unexpectedly lifted at the halfway turnaround point when I realized that there was only one woman ahead of me on the road course. Unfortunately I wasn’t able to make up any ground on her after the turnaround and two other women ended up passing me in the final mile but I still finished the race in a solid 24:06. Not bad for a 19° January morning!! Warming up in the car after running. My predicted time was 23:53 (my official results time from Martin’s Run) so my actual time ended up being off by 13 seconds. That was good enough for 5th place overall in terms of prediction accuracy, woohoo! The first place person was only off of their predicted time by a mere 2 seconds. Considering that no one had watches or any idea of the time that’s pretty amazing!! My next race will be the third 5K in the Athlete’s Closet Winter Series on February 7th. In the meantime I get two whole weekends off from racing. After a long business trip to Las Vegas last week (and a super-cramped red-eye flight home all night last night, ugh!) 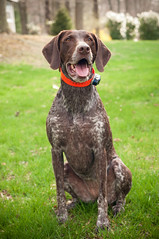 I am looking forward to spending some quality time relaxing on the couch with Matt and Piper! 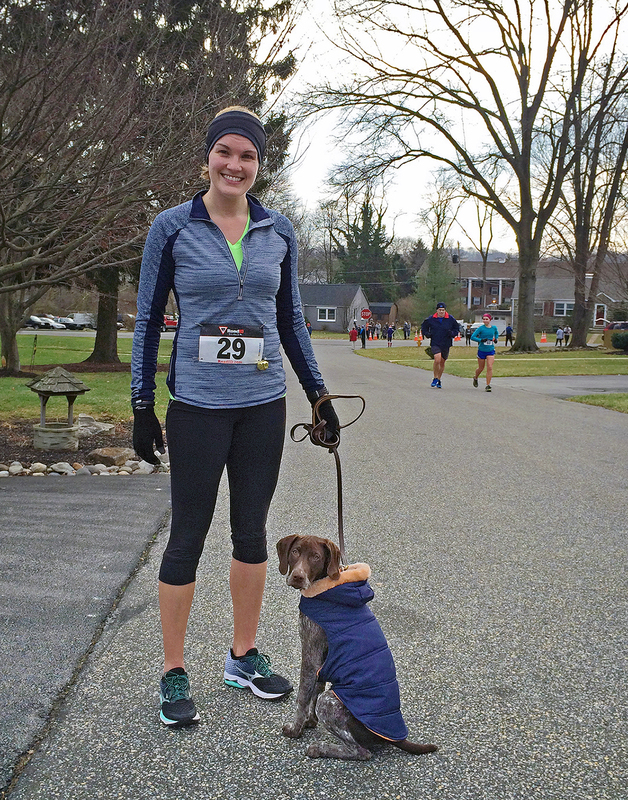 On January 3rd I ran my second race of 2015, the Athlete’s Closet New Year’s 5K in West Chester, PA. After a fast race on New Year’s Day my plan was to show up, have fun, and stay relaxed. The verdict? I ended up running a comfortable, happy race and still had enough gas in the tank to totally crush the finish with a huge spurt of speed, putting down a new course personal best time in the process. Oh yeah! It’s no secret that I tend to go out way too fast in the first mile of a 5K. 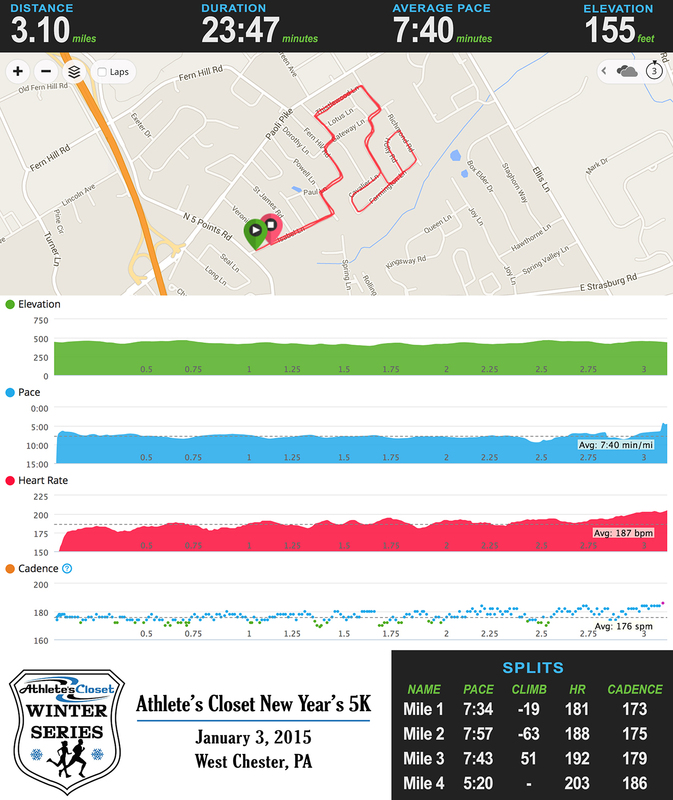 On New Year’s Day when I was trying to run a PR I completed my first mile in 7:15. Yikes!! During Saturday’s “fun, relaxed” race, by comparison, I went out in a much more practical 7:34 and, not surprisingly, felt significantly better during the second half of the race. I felt so good, in fact, that in the last mile when the course began a long uphill climb I was able to pass a man who had been holding steady in front of me for the first two miles. It feels strange to say it, but after all of my hill running I may actually LIKE hills now!! My relaxed first mile really paid off in the final stretch of Saturday’s race when I made the last turn back onto Isabel Lane. The finish line had not yet come into view but what WAS in view were the two runners ahead of me. The first was a man who had previously been running with hill guy. He was pretty close to me so I figured that I could probably catch him as we closed in on the finish. The second runner was a woman in neon yellow who was way, WAY ahead of me. Normally I never would have considered her to be within reach but something suddenly clicked in my brain and I found myself utterly determined to catch her. I picked up my pace and watched the space between us disappear. 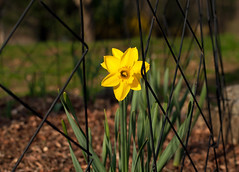 In a blur I saw someone warning her I was coming but then I shifted gears again into what felt like a full out sprint. I blew through the finish with a second to spare. What an exhilarating way to end a race! Matt and Piper stayed at home on Saturday so the photo for this recap was just going to be an in-the-car selfie BUT, as luck would have it, one of the race organizers from the Athlete’s Closet captured the above photo just before the finish. Perfect timing!! I was surprised to see how calm my facial expression looks in this photo considering how hard I felt I was running! My next race will be the Pickle Run in Ridley Creek State Park on January 17th. Like the Pickle Run that I did in August, this will be a fun prediction-style race with no watches allowed. Hopefully I can match Saturday’s relaxed first mile pace without my Garmin’s help! 1 Mississippi, 2 Mississippi, 3 Mississippi, 4 Mississippi. THAT’S how close I came to beating my 5K PR this morning!! 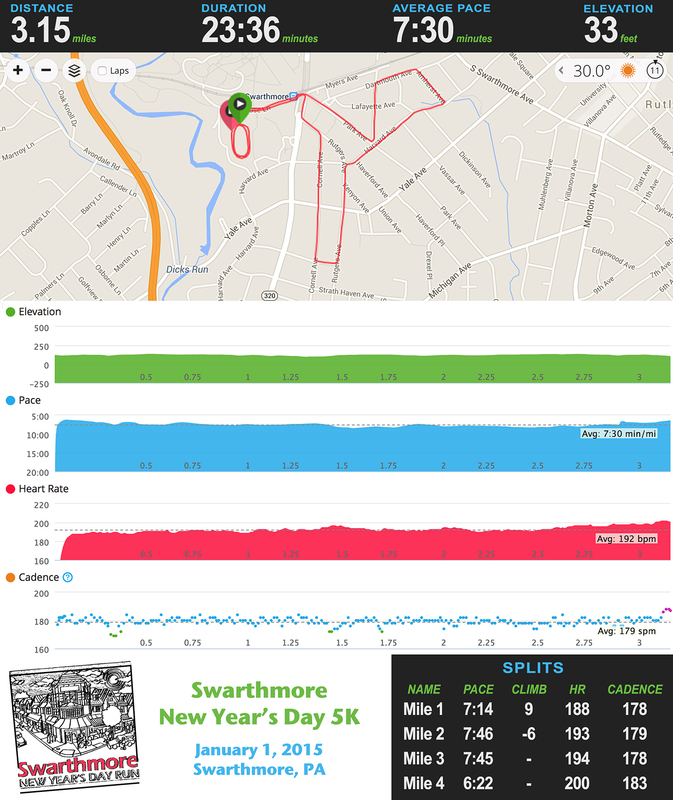 I kicked off my 2015 with the S.R.A New Year’s Day 5K in Swarthmore, PA. 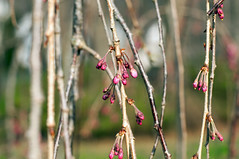 The weather was sunny and brisk and the race was well organized with a great turnout of around 220 runners. 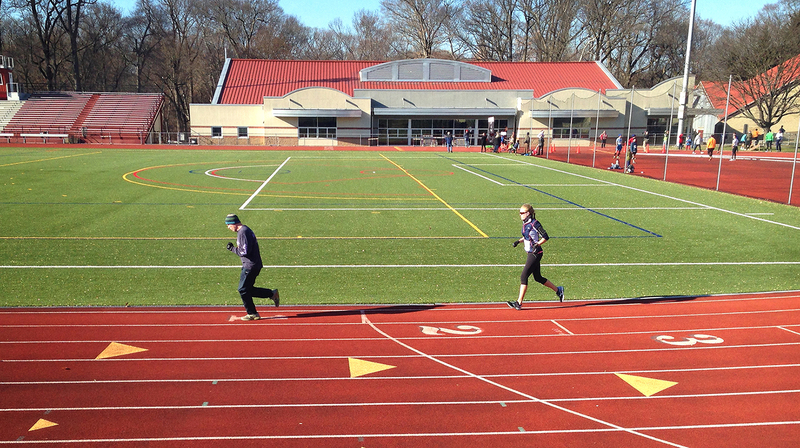 The course was fun and relatively flat, starting and finishing with laps on the Swarthmore College track. I really wanted to run a new personal best in this race. As the opening line of this post indicates, I did not quite get my PR, but I feel confident saying that I put forth the absolute best effort that I was capable of today. Although my official finish time of 23:36 was 4 seconds short of my PR from November’s Trinity Berwyn 5K, I think this was still my fastest 5K pace ever (Trinity might have been a little short) and I certainly FELT like I was running my hardest the while time! Apparently my new Garmin heart rate monitor agrees… I averaged 192 bpm and maxed out at 202 bpm in the final 0.1 miles… I have no idea what my max heart rate is but that’s probably pretty close!! The first mile of the race included a lap around the track and a gentle uphill and before I knew it my Garmin was beeping a 7:14 first split. Good start! As the second mile began I focused on my cadence, quickly getting my feet down on the pavement, especially when I started to feel a little tired. The second mile was over in 7:46… not quite where I wanted to be but my second mile tends to be my slowest. I knew that if I was going to beat my PR I would need to maintain around a 7:30 pace. My first two splits averaged out to exactly 7:30 but I was feeling a little discouraged (and a lot tired) at the start of mile 3. I kept focusing on my cadence (which apparently worked… I averaged 179 steps per minute throughout the whole race!) and tried to stay strong. I saw Matt and Piper cheering me on by the college field house at the 21 minute mark and entered the stadium at 21:47 with a lap to go. I knew at that point that I wasn’t going to quite get my PR but I still ran that last quarter mile as hard as I could. I crossed the line with an official chip time of 23:36, just 4 seconds shy of my goal. This is going to make a good xmas ornament next year. My next race is Saturday (I guess I should stop drinking beer and start re-hydrating now??) when I tackle the Athlete’s Closet 5K course in West Chester for the 5th time. I’ll see how I feel by then but that race will probably end up being a little more laid back than today’s speedy tour of Swarthmore! 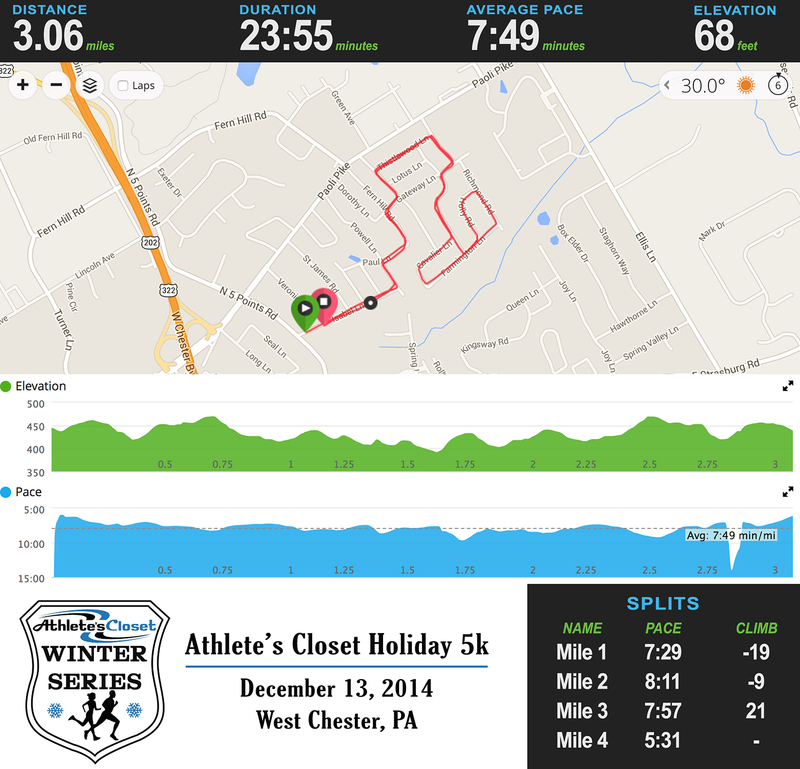 Yesterday morning I ran the Athlete’s Closet Holiday 5K, the first of four races in the Athlete’s Closet Winter Series in West Chester, PA. 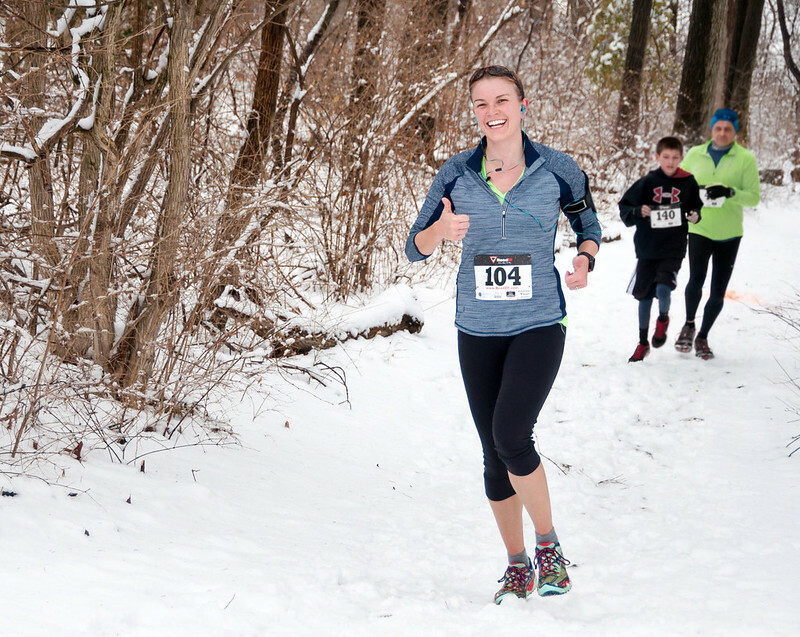 I ran this series last winter and had fun (despite the 10° temperature for January’s race!) so I signed up again for the whole series this year. 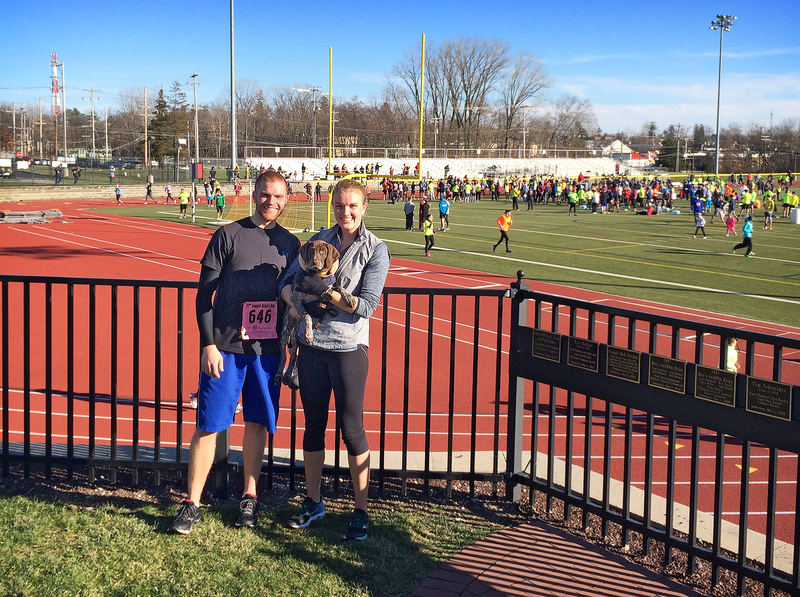 As usual, Matt and Piper came along to watch — race-spectating is a great way to socialize and tire out a puppy! Matt and Piper went for a walk during the race and, much to Matt’s surprise, they discovered a paddock full of llamas right in the middle of an otherwise normal suburban neighborhood street!! 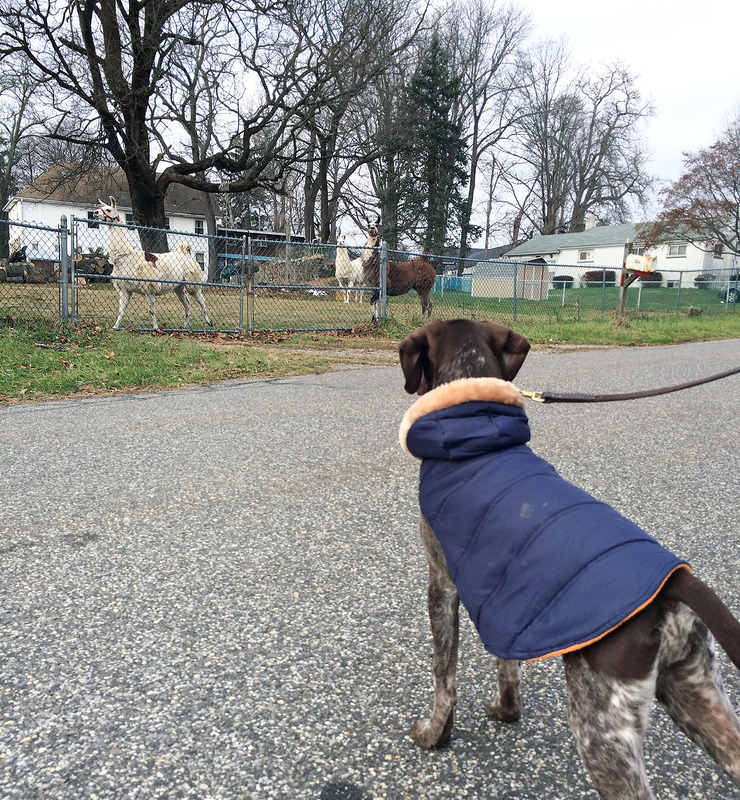 Piper and the llamas seemed equally fascinated by one another… the llamas trotted right over to the fence to check her out and Piper watched cautiously from the other side of the street, blurting out a few tentative “woofs” to see what they’d do (the llamas didn’t care). Matt brought me over to the llamas to show me Piper’s reaction after the race was over. Very funny! But back to the race… I remembered from last year’s races that this 5K course isn’t particularly exciting or easy. It zig-zags out through hilly neighborhoods, loops around a bit and then zig-zags back to the finish. I find the constant turns to be disorienting (I never know which direction I’m pointing until I get back to the road where the finish line is) but after running this course three times last winter I at least have a better idea of when to expect the next hill. The first mile of the race flew by in a quick 7:29. The second mile suddenly felt a lot harder and crept by in a sluggish-feeling 8:11. But then my legs redeemed themselves during mile 3 when I was able to pick up my pace up a long hill (passing 2 people!) and then finish strong with a final split of 7:57. After running two races last weekend I went into this race just wanting to have fun and stay relaxed and with a finish time of 23:55 I think I certainly accomplished that goal! I’ll be capping off 2014 with two final events: a fun, 3 mile prediction run at The Running Place next weekend and then the New Year’s Eve 5K at the Upper Main Line YMCA. Last year I ran a PR at the New Year’s Eve race and I’ve already set my sights on a new PR there this year! 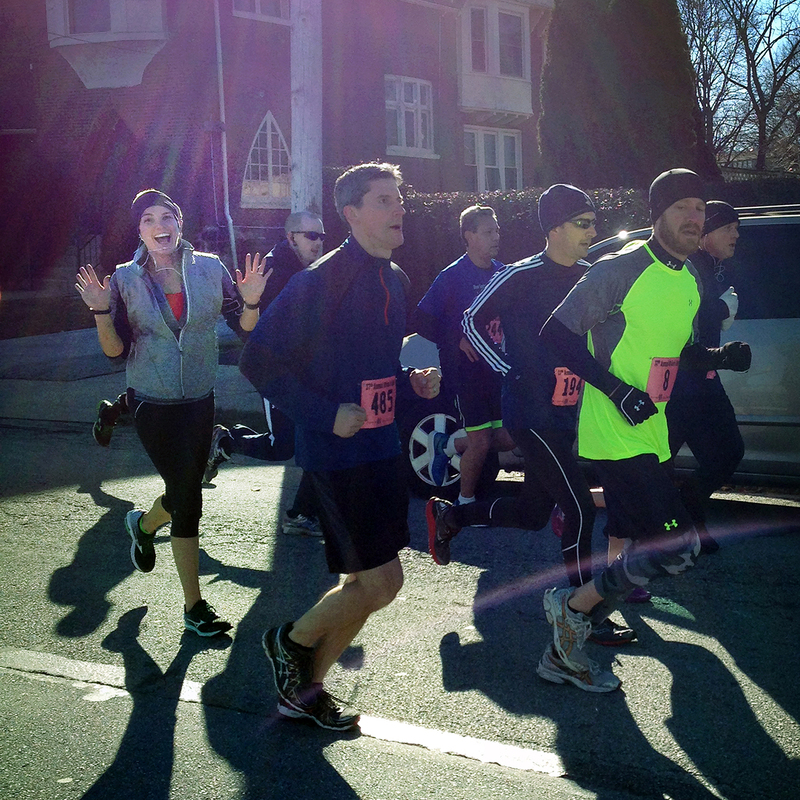 On Sunday I ran the 37th Annual Brian’s Run, a well-attended, well-organized local race in West Chester, PA. The race went really, really well. 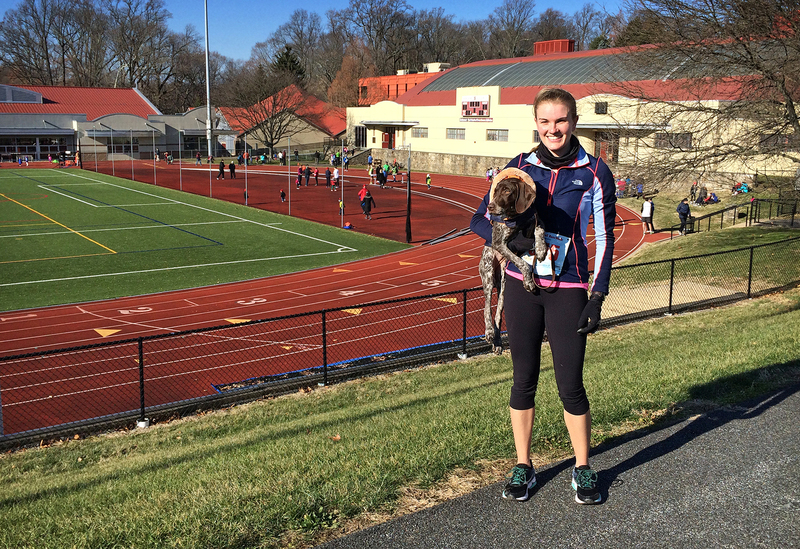 The sun was shining, the crowd support was fantastic, and oh yeah… I ran a HUGE PR!! I finished the 5 mile course in 39:11, nearly a minute and 20 seconds faster than my previous best time from the Swarthmore 8K in July. Woohoo!! There were so many good things about Sunday’s race. My brother Billy ran with me (well, not WITH me because he took off at the start and beat me by 20 seconds, but still, he was there!) and Matt and Piper formed our personal cheering section. I passed them about a mile and a quarter into the race and smiled for the camera… I think my expression pretty much sums up how I was feeling! Control was my keyword for the 5 mile course. I have often struggled with going out too fast in a 5K and then feeling really terrible with a mile to go. I did not want to make that mistake in a 5 mile race so I really focused on making sure that my first mile was comfortable, relaxed and under control. I checked my Garmin throughout the first mile and knew that I was going fast (it ended up being a 7:33 split), but I felt really good so I just rolled with it. Because I had banked some time during the first two miles I wasn’t too worried when my Garmin beeped an 8:09 and 8:16 for my middle miles. Ok, maybe I was a little worried by that 8:16, but by then I had just a mile to go! After a final hill climb I returned to flatter ground and completed the race with a lap around the big red Henderson High School track. It was a fun way to end a race! Shockingly, I somehow picked up my pace enough during the last mile to put down my fastest split of the day. I didn’t see that coming! I finished with an official time of 39:11, good enough for 133rd overall out of 582 runners, 31st female and 15th in my age group. The full results are here… check out that first place finish time of 24:35, whoa! My next race will be the first of the Athlete’s Closet Winter Series 5Ks next Saturday morning. After last weekend’s double races I’m just planning on going out and having fun! 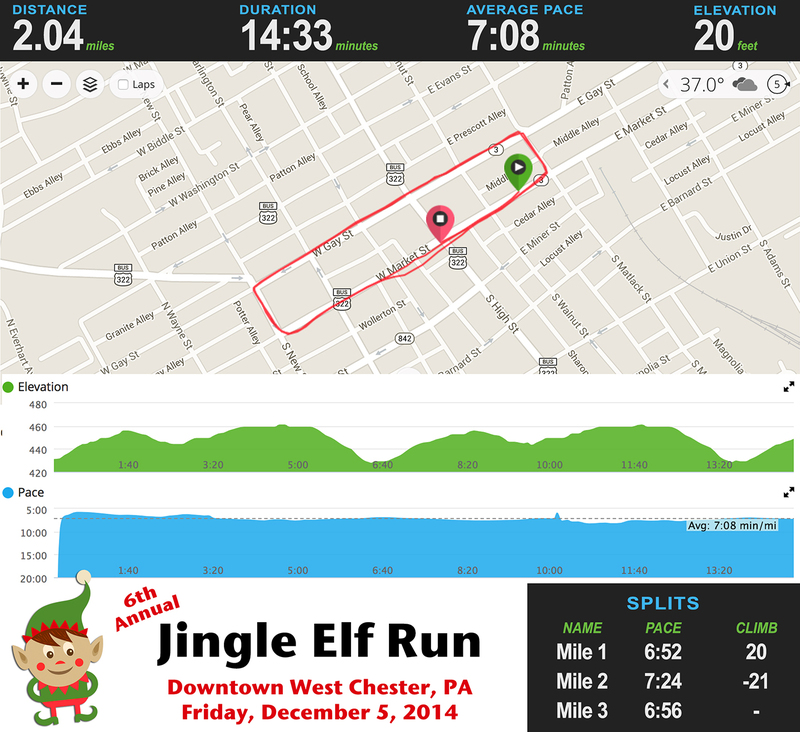 On Friday night I ran the Jingle Elf Run in West Chester, PA. The 2 mile race circled through downtown West Chester and kicked off the borough’s GIGANTIC Christmas parade. I had no idea how big the parade and surrounding festivities were going to be beforehand but let me tell you, West Chester takes the holidays seriously! After driving around for 25 minutes trying to find parking (and finally ending up on the 6th floor of a parking garage because the first 5 were completely full already!) 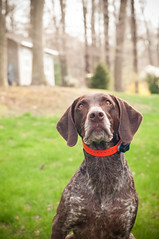 Matt, Piper and I finally arrived at Chester County Running Store to pick up my bib. Despite a steady drizzle West Chester’s Market Street was already packed with spectators at 6:15 (the parade didn’t start until 7:30!) and there were TV lights and stages and barricades everywhere. It was a very exciting atmosphere for a race! Promptly at 6:30 the race began and 181 runners (many dressed as elves) surged up Market Street towards the TV lights. The race course was 2 laps around a nice, easy-to-remember rectangular route that was relatively flat and wide with nice turns and fantastic crowd support. We ran west on Market, turned north on New for a block, then came east on Gay Street, West Chester’s main restaurant and shopping area, before a quick turn south on Matlack which brought us back to the bright lights of Market. Of course after my blazing fast first mile I still had another to go. I really tried to stay strong for that final mile but let me tell you… Gay Street seemed much longer the second time around!! With about 1/4 mile to go I saw Matt and Piper cheering me on from the sidewalk and I picked up my pace to the finish (I tried, at least). My garmin chirped a 2nd mile split of 7:24 shortly before I crossed the finish line with an official time of 14:33. Yes!!! 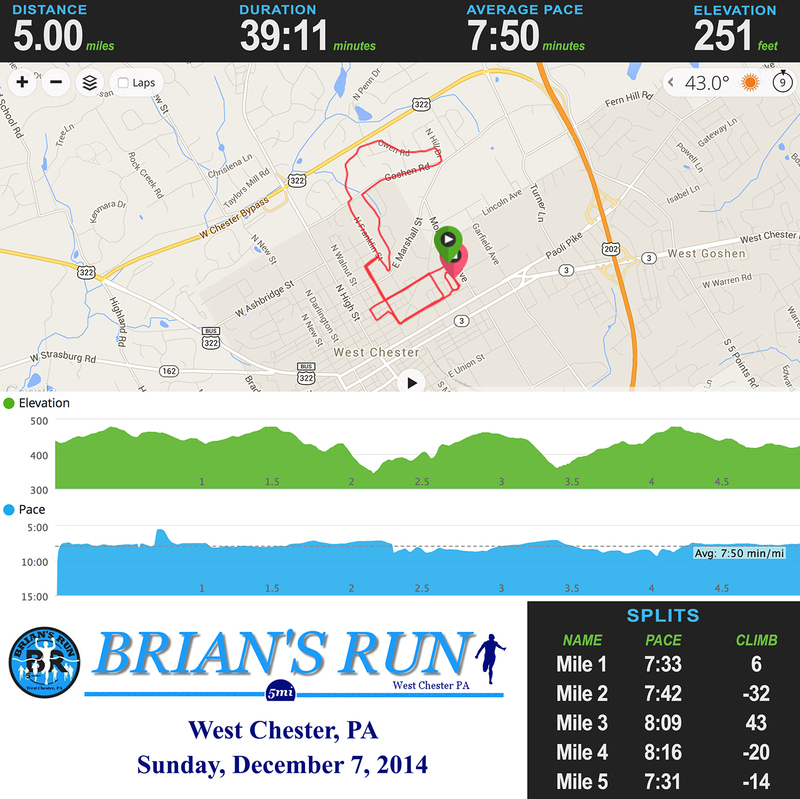 My next race starts in 2 hours… it’s the 5 mile Brian’s Run, also in West Chester. I think my legs have recovered from Friday and I’m hunting for another PR… wish me luck!